To get you started, we’ll first share 12 solid ways to market your college bookstore. Lastly, we’ll end the article with links to other articles and resources that give you great ideas for getting more customers to your college bookstore. Our quality stoneware allows you to give your customers something one-of-kind to remember their time at your college campus. Our handmade pottery mugs are made right here in the USA. These mugs are from a family-owned company and each piece we make is touched by over 24 pairs of hands throughout the creation process. And although amazingly uniform, no two are exactly the same, so they are as unique as your college bookstore. Enjoy the resources below, and we wish you success in your endeavor! Keeping your brand in front of your target consumer is incredibly important. You just need to know where they’re searching. Regularly adding your college bookstore to niche directories will help you expand your brand on the web. Enter contests, such as the National Association of College Store Magazine’s annual Cool Ideas Contest, where college bookstores can compete by entering their clever marketing ideas. At the very least, you may receive a link from the site, increasing your domain authority for improved SEO. One thing that all students universally love is free items. Whether it be pens, notebooks, lunch, or even coupons; students will come if they know it’s free. Talk to your college about sponsoring an event to help draw students in. Give them free lunch, raffle off free items such as t-shirts and backpacks, and give out coupons for discounts on textbooks. These are all things that students enjoy and it will draw them to your event. Make the store appear as if it is a place where students can get all their basic needs, no matter what it happens to be. The thing with college students is, they are not going to deviate from their normal routine if they do not see a point. Make your bookstore something that students just can’t refuse. Decorate with loud colors and patterns, put on a trendy radio station, and use something to entice in student who would not normally give the store their time of day. It’s all about grabbing the student’s attention and, with so many things vying for that attention, it is important that you make yourself stand out from the crowd and get an “in your face” type of marketing strategy. This is the kind of thing that is going to make students curious and want to come inside. Is there something in the area that all students love but can’t get off campus to get? Have you noticed that students around campus have been wishing for something in particular? Listen to your students and pick up the things that they want and need. You may think that those book covers are cool, but if they are not moving, students are not enjoying them. Keep an ear open and try to figure out what products a majority of the students are after. Once you know, try to get as many as you can into the store and advertise their availability. This is a great way to attract students into the store and buying more than just what they came in for. Social media, apps, and smartphones are the books of the future. Today, you see more students with their heads hovered over their tablet than you do with their heads in a paperback. This is not necessarily a bad change, unless you are not going with it. As times change, so should you and your marketing strategy. Consider pulling students in through the world of social media. Create a Facebook page, have on-shift employees update the store Twitter, and use the power of the university’s mobile site to get a featured space that students can see. The truth of today is, students are not going to take the time to read that great flyer hanging up on the board and notifications through their college email are going to fail. By using a social media platform to engage with students and be entertaining, more students are going to become potential customers to the college bookstore and not the gas station across the street from the dorms. Also, you need to remember to evolve as time goes on. Referencing the same YouTube video for three years is going to make you seem lame all over again. Marketing in today’s society is no longer a one time deal, you have to keep renovating. More than anything, students just want to get their mom and dad off their back and live their own lives. What better way to market than to go straight to the parents? Show them the products you have that their kid needs and make them see you as the “one stop shop” for all their students college essentials. By doing this, you can increase the number of students who come in during orientation and tours… not to mention their parents who carry the cash. You also have a better chance of mom and dad convincing their student to come down to the store from their dorm than any other advertising does. After all, parents want what is best for their kids, and the students will be more likely to listen just to get their parents to stop talking. Any store will make a name for themselves when they’re constantly flashing their logo and products around campus. It is crucial to your marketing that you stay up-to-date on what is happening with student culture. Go to clubs and ask to help with their events in exchange for your name on their posters and a booth at the event. Offer to set up sponsored raffles during awareness campaigns and speeches. If there is a big sports rivalry, offer to help the campus get ready for the big game in exchange for some sort of advertising. The idea is to get your name out there. The more often students see the store name, the more likely they’ll stop in for a snack, a college t-shirt, their textbooks, or a million other things that a college student might need. And, do not forget about your commuter students. You may want to get in contact with your university’s commuter association and ask if you can advertise with them. Let commuter students know you have all the essentials for when they forget something at home. Commuter students can be a big market for college book stores because they just can’t simply run back to their dorm for important items that go missing. The one thing all college students have in common is the experience about being in college. You want to use this to your advantage as being a college bookstore gives you the unique advantage of understanding the college experience. Gear your marketing toward how you can help incoming students prepare for classes and how already existing students can use the store as a way to help them through those homesick times. Find a niche way to use the college experience within your store marketing. You never know what is going to stick, so try different angles until something works with the students you cater to. You most likely have a website, and whether or not it’s optimized for SEO and designed around internet marketing best practices, implementing a blog is probably the easiest and best way to expand your digital presence. Blogging keeps your brand on the forefront of your industry, while bringing in site traffic through search engines like Google. By updating your blog every day, or a few times a week, you’re building a new point of entry to your site and new opportunities for consumers to find you. Build content that is useful to your target consumers, such as The First-Time Parent’s Guide To Preparing Your Child For College, or The Student Handbook to Saving Money on Textbooks. By helping the consumer with informative content, you’re eliciting a positive emotional response within the consumer, which they will then associate with your brand. 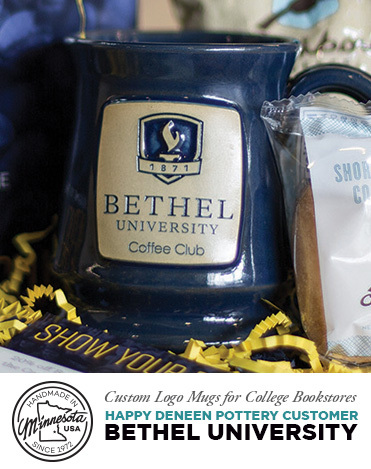 Whether you want them to be signature pieces at your college bookstore, or you want to make a profit, Deneen Pottery offers custom mugs for college bookstores that people will fawn over. People love handmade souvenirs from the places they feel close to. 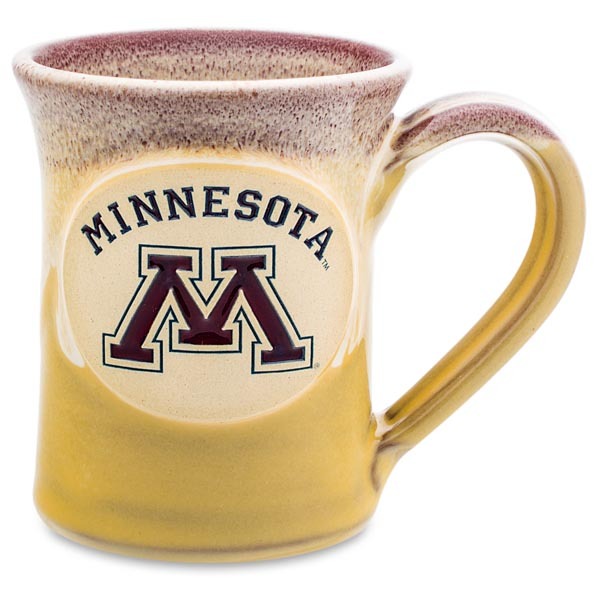 Plus, those college students will need a cool mug for the coffee they’ll be drinking to stay up late and study! Now they can take a little piece of college home with them. The Curious Longevity of the College Bookstore – A fascinating read about the decline in bookstores and how college bookstores across the country are navigating the tumultuous industry landscape. Rethinking the College Bookstore – a great article detailing three ways to improve the college bookstore experience. Liking your College Store – This article expands on information related to campus retail and the future of marketing for bookstores as they morph into digital and online retailers. 7 Habits of Highly Effective Bookstores on Facebook – 7 Great examples of bookstores habits on Facebook to keep in front of your audience. It takes persistence, but can be built into your routine. The Best Marketing Ideas for Bookstores – Smart and savvy ways to make your bookstore an experience. Beyond marketing, this article talks serious strategy for making your bookstore more involved and many examples can really be applied in the college community. Nation Associate of College Stores: Spending on School Materials Report – A report from the NACS that shows college student behavior in campus retail spending. This includes average spending, enrollment and other shopping behaviors of college students. Cracking the College Bookstore Market – This report may be a little old (noticeable by the style used on “Web Site”[sic]), but nevertheless offers insights into the basics of running a textbook store. White Paper – Football Season Marketing – This white paper explains general marketing tactics to reach college students, and discusses integrated marketing. 4 Insightful Ideas for Your Bookstore Marketing – Hold Book Club Meetings, and have a coffee shop in the bookstore are two worthwhile pieces of strategy from this little article on bookstore marketing. How to Develop a CRM Strategy for a Bookstore – This great resource talks about ways to get feedback for your bookstore, and incorporate that feedback into the promotion and experience of your bookstore. What are our College Bookstore Customers Saying about us?